The tower you can lean on just got leaner. 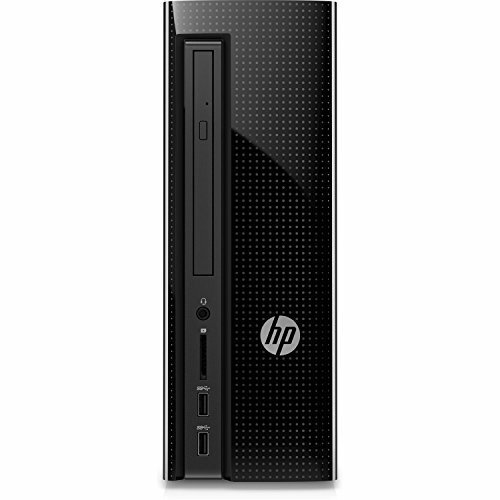 Conquer your day with this newly redesigned HP tower that is reliable, slimmer, and also affordable. Why buy: An affordable desktop with expanded storage, tested reliability, and space-saving design.More productive. Windows 10 is the best for bringing ideas forward and getting things done. Processor: Intel(R) Pentium(R) Processor J4205, Quad-Core, 1.50GHz; Handle multitasking reliably with the perfect combination of performance, power consumption, and value.Ports: Headphone/Microphone Combo, 2 USB 2.0 (front), 2 USB 2.0 (rear), 2 USB 3.0 (rear), HDMI Out (rear), VGA (rear), 10/100/1000 Base-T Network, and an HP 3-in-1 Media Card Reader help you stay connected. Hard drive: 1 TB 7200RPM SATA; Store all your digital content and still have room left over.Keyboard and mouse: Comes with the HP Premium Lifestyle Wireless Keyboard with volume control and optical mouse..More productive. Windows 10 is the best for bringing ideas forward and getting things done.